Ever since people can remember, the land around Perticara was mined for sulphur. It had the largest amou nt of sulphur in Europe and from 1917 it was mined on a large scale, to a depth of 700 meters. Sulphur was used for the production of things such as gunpowder and all kinds of agents for agriculture. The mine closed in 1964, when sulphur became more cheaply available as a by-product of refinery. 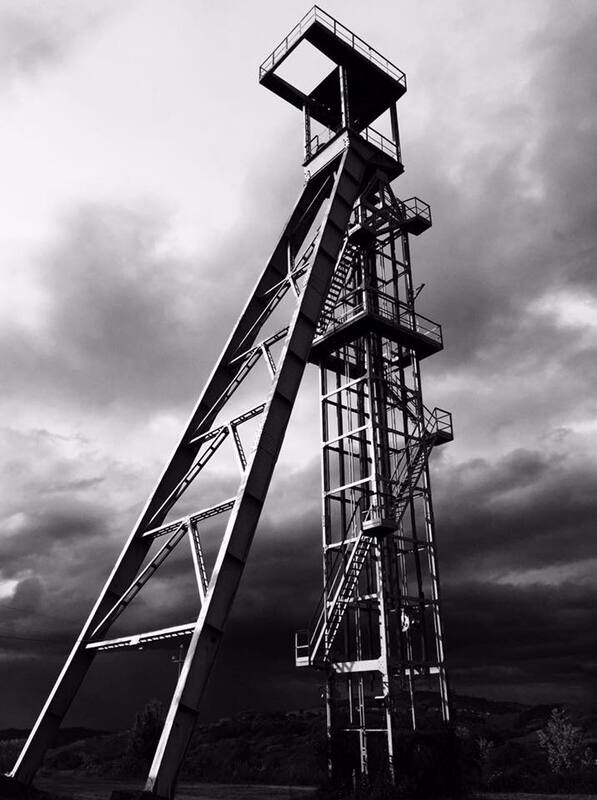 The Mining Museum is located in the original mine buildings and gives a good insight into the history of Perticara. If there is enough interest, an excursion to the Mining Museum can be organised from the site. In the villages close by there are morning markets on various days; some larger than others, but all with a large vegetable and fruit stall. The Italians buy a great deal from markets themselves, and you will find a wide range of good quality items. On Fridays there is a small market in Perticara and on a Monday there is a large market in Novafeltria. Each Monday in September, there is a special market in Pugliano: a two-hectare open air market where the Italians drink, eat and do all of their shopping: from lettuce to beef, from curios to antiques and from candy to fish. There are also markets where you can buy art and antiques. And on the first Sunday of the month, there are large antiques markets in Santarcangelo and in Arezzo (also on the previous Saturday). Ask at the campsite reception for more information. Underneath the mountain on which Perticara sits is Novafeltria, the commercial centre of the area. 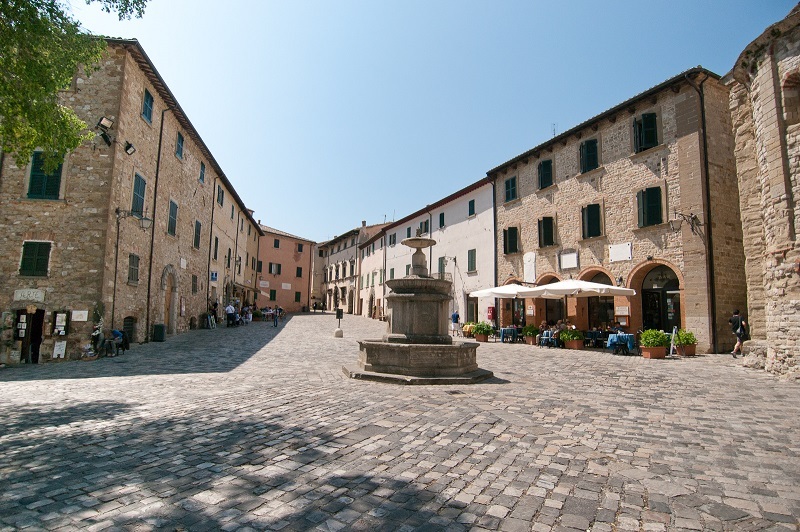 You will find larger supermarkets, petrol stations and garages, a number of lovely churches, a typical Italian square and – don’t forget – the road to San Marino and Rimini. 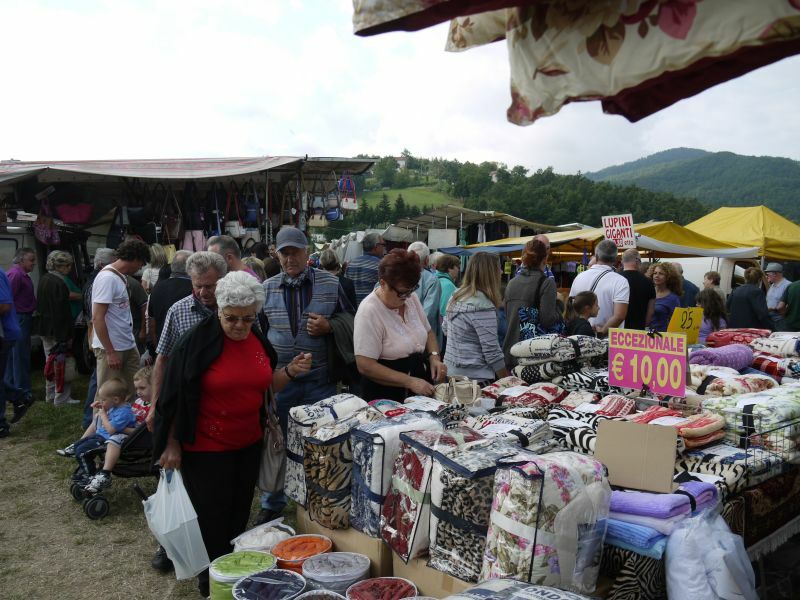 On Monday mornings there is a large market in Novafeltria, not something to be missed. Even though there are hardly any tourists – apart from those from our campsite. TeatroThis village is dominated by the castle of ‘Rocca Fregosa’, built in the 10th century, currently serving as a museum and art space. The historical centre has remained well preserved, with the highpoint being the 16th Teatro Mariani, made entirely from wood. In October, Sant’Agata is at the centre of a national truffle celebration, as the white truffle is to be found in this area. In September and October in particular, almost all local restaurants have truffle dishes on the menu. And all just ten minutes away from the campsite! or example, a Bow belonging to Augustus from 27 BC and the Ponte di Tiberio from the 1st century AD. 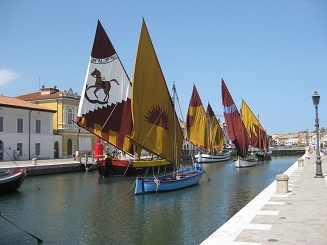 Just to the north of Rimini is Cesenatico, a little historic fishing village. In the harbour museum lay old fishing boats. In the many restaurants, delicious fish dishes are the order of the day. It seems as if time has stood still in San Leo. It has a wonderful rocky location, with an impressive fortress on top of the rocks, in the 15th century the ‘most beautiful and largest war horse in the region.’ The Parish Church from the 11th century, the Cathedral from 1173 and the Cloister of Santa Igne from 1243 are worth a visit. Its location at 600 meters up means that San Leo has a fabulous view out across the surrounding hills and valleys. 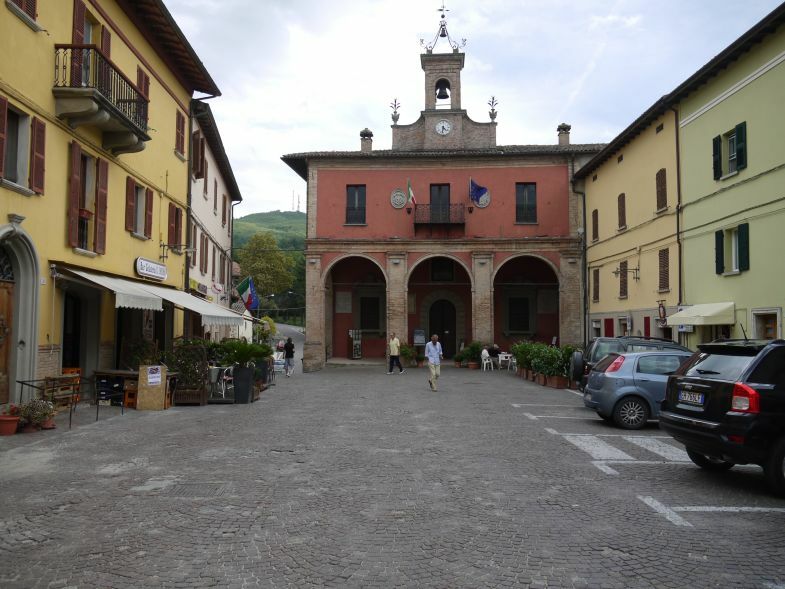 San Leo is about a twenty minute drive from the campsite and has – in addition to the all of the historical sites – am amazing ice cream parlour! San Marino little further out than San Leo is San Marino, the miniature state annex tax haven – and the oldest republic in the world. Located on a high mountain, San Marino is visible from the road to the campsite. After a journey of around three quarters of an hour, you will find yourself in a beautiful city with many steep streets full of little shops. 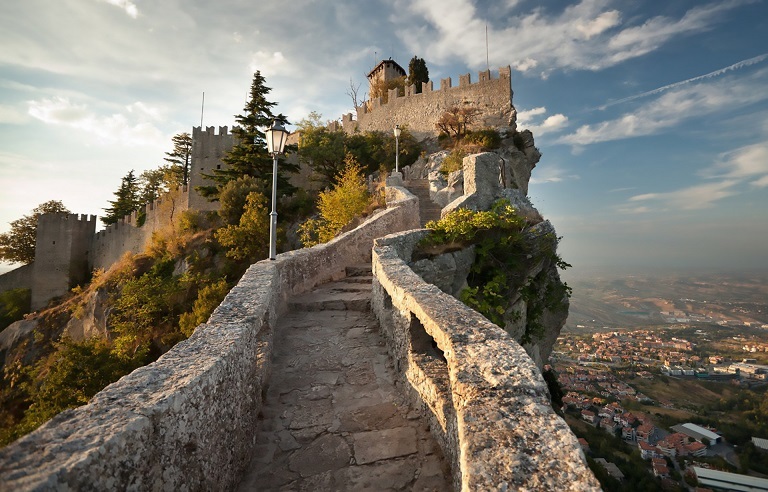 Leather jackets and bags, local drinks and snacks, many perfumes and jewels and even all kind of weaponry: you can find everything you are looking for in San Marino. The countless little terraces with their lovely views ensure that you will quickly forget the exhaustion from the steep streets. And should you happen to find yourself in possession of any, Euro coins from San Marino are very desirable collectables!